Post your Windows 7 Performance Index ! 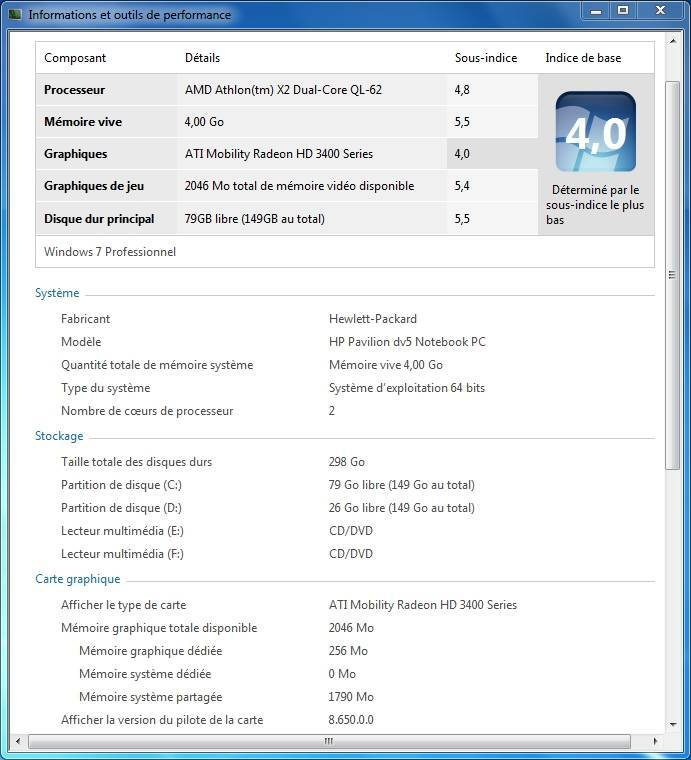 Hi, i don't know if this topic was posted before, but it would be nice if everyone could post his Windows Performance Index under Windows 7 to compare Processors and Graphics scors. I have an HP Pavilion dv5-1150em, the subscore for my processor varies depending on the type of system. i got 4.6 under 32bit edition, and 4.8 under 64bit edition. for the graphics the subscore varies depanding the version of the display driver but it does not exceed 4.1 (currently i use the Catalyst 9.9). Admin Edit: Windows 8.1 users can use this tool to bring back the Windows Experience Index feature in Windows 8.1. Edited by pakistanipower, 13 September 2009 - 05:45 AM. Edited by perern, 13 September 2009 - 09:57 AM. getting ultimate 64-bit edition soon. Edited by maikati, 13 September 2009 - 10:52 AM. I am running 7 RTM 64-bit with an unlocked 4th core on my AMD Phenom II X3 720 BE. Edited by xsever, 13 September 2009 - 02:50 PM. im anxiously waiting for my upgrade disk to come in the mail. When i get it i will post. Edited by CommonSense, 13 September 2009 - 03:21 PM. Seriously need to upgrade my HD. Haha well today I upgraded my laptop's HDD and RAM, but lol.. 2.2? Wow. Why do i have 3 times "6.1" and not "6.2" or whatever?.. does this mean if i increase the partition size i will have a better rating there? or is "5.9" the highest for that part?? No, the explanation for the rating of your HDD has more to do with the technology rather than how much space you have left. And why 3 times 6.1 instead of 6.2? Well, obviously your hardware isn't good enough to deserve a 6.2. The subscore of your hard drive has a relation with the Write rate and the Hard Drive cache, this varies depending on each one, and of course SSD's can get higher scores than Hard Drives. I know that the Windows Performance Index is not the best benchmarking tool, but I am surprised that my 135$ AMD Phenom II X4 720 gets a 7.3 while the Core i7 920 gets a 7.4 at 280$! to get the fully detailed specs with their respective indices.